Our surroundings undeniably have an effect on us, even if it’s just a subconscious one. Do you find it easier to feel relaxed and concentrate in a plain room full of clutter or a calming, aesthetically pleasing room? 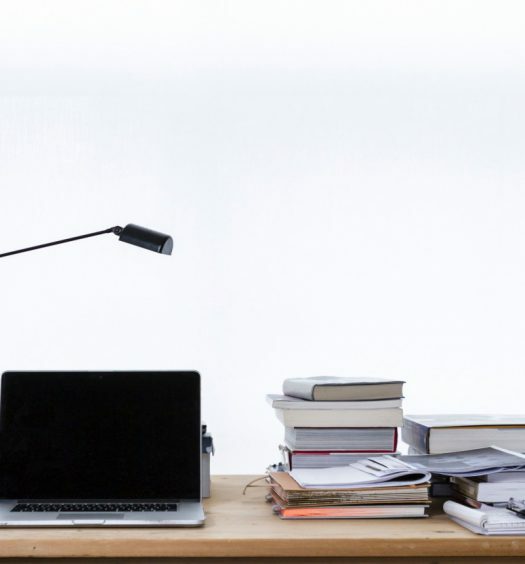 Your home office is your sanctuary, and it should look that way. 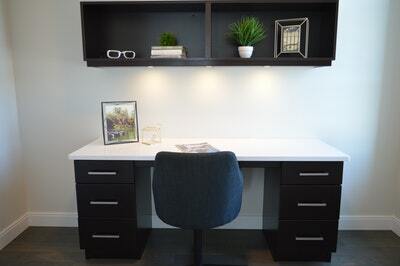 Not only will a beautiful home office make you feel better, but this extra happiness could also contribute to your productivity levels. 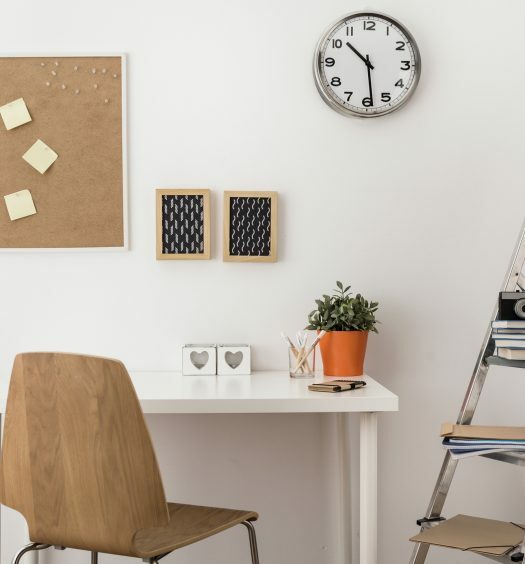 In this article, we’re going to give you 10 home office wall décor ideas that will completely transform your workspace for the better. None of these will cost too much, so if your budget allows, feel free to choose multiple options for your own unique design and layout. Color is a very effective way to transform your home office into something completely new. This simple, yet effective, change will help turn your office into what you want it to be instead of a dull place you dread going to. If you’re working with a small space, light neutral tones can make it feel more spacious. For a smaller room, if you choose to use an intense color, it’s better to have it on just one or two walls, rather than on all four. You might really, really love the color blue, but that doesn’t mean everything in your office should have this tone. Think about accent colors, as well, items that will really pop against the solid color of your wall. You might choose to paint your walls gold and have wooden furniture to offset the color or pale green walls with white furniture. 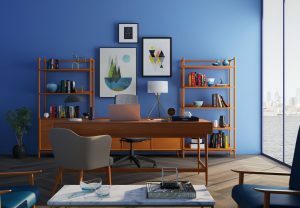 It shouldn’t only be about the colors you favor when you’re painting your home office, but also the mood you want to create. If you’re a salesperson, for example, a vibrant and energy-raising color like red or orange could be a good choice for the main theme. Whereas, if you’re a nature photographer, you might want to set the tone with forest green and other natural colors. In essence, think about what you like, but don’t forget to set the mood for your particular line of work. Too much of one color feels unbalanced, while too many varying colors can create a subconscious feeling of disorder. Don’t be afraid to think about color ideas and various combinations for a while before deciding. After all, painting takes time and lasts a while. When you’re thinking about redecorating and you don’t plan to paint, it makes sense to start with the wallpaper. Beginning here will ensure that you don’t have to take items off the wall to put wallpaper up later. Choosing the right design can make you feel more energized, calm, or engaged with your work. It has a cleaner look than white walls, which tend to look dingy over time. In addition, it will send a good impression if you meet someone in your office. Don’t forget to return to the classics when it comes to decorating ideas, like wall art. This can mean posters, paintings, prints, or even photos hung on the wall. I suggest thinking about the mood you’d like to set with the art you choose and plan accordingly. For example, if you’d like to learn to be calmer while you work, photos of water may be helpful. If there’s a particular artist that’s your favorite, see about getting a poster or prints of their work. A bulletin board is not only practical but can look really nice when you choose the right one. There are countless bulletin board ideas you can use for your office, from cork board to a fabric design. Although it seems like most everything is becoming digitized in modern business, some of us like to have a physical representation for business reminders. A bulletin board is a good way to create this for your home office. Inspiration helps a lot with staying in the flow at work. It can motivate you to get back to work after a long break or just keep you going when you’re on a long conference call. Putting inspirational quotes up around your office can get you through your afternoon slump. 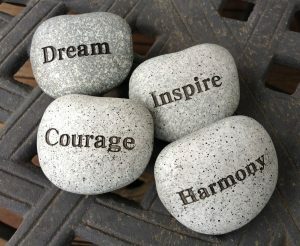 There are many different ways you can place inspirational quotes around your home office, including posters on the wall, your coffee mug, or even stones. Woven wall hangings never go out of style and can give your space a nice, comfortable vibe. You can even find tapestries large enough to cover most of your wall, so they can work as an alternative to wallpaper. If you tend to gravitate towards natural color schemes or earthy tones, finding one that you like shouldn’t be hard at all. A quality wall tapestry can turn a drab space into something far more inspiring. Most tapestries are very detailed with just enough color to add some beauty to the wall. From natural scenes to mandalas, you’ll find no shortage of options for this particular design element. 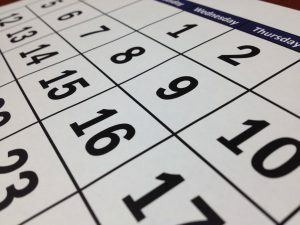 A physical calendar may seem like outdated technology to some people, but there are several benefits to using one on your wall as opposed to relying only on the planner on your smartphone. Instead of having to pull out of your phone each time you need to see if you’re free on a certain date, you’ll already have it all laid out right in front of you with a calendar. Not to mention that checking your phone calendar while on the phone is inconvenient, if not impossible. It can be easy to procrastinate on your tasks when you work at home, especially when your deadlines aren’t right in front of you. But when you have your calendar right there on the wall, you’ll have a harder time justifying slacking off. Another great benefit of a physical calendar on your wall in the home office is that you don’t have to charge it. When your phone is in the other room charging, your calendar will still be there with your schedule, so you can check it any time. Shelves might be something you think about in terms of practicality, but they can be so much more than that. Shelving can completely change your office décor, clearing clutter and even adding to your color scheme. 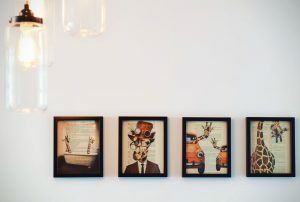 While these aren’t technically wall decorations, they do enhance the beauty of a room immensely. People just naturally love greenery and fresh air, and sometimes it’s hard to be stuck inside working on a nice day. But having plants in your home office can brighten up the space and your mood. 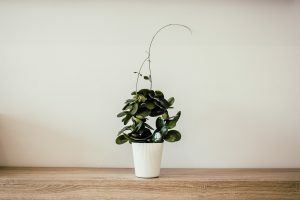 Studies show that indoor plants have positive impacts on people as they work. Not to mention that they help clean the air and keep it fresh. 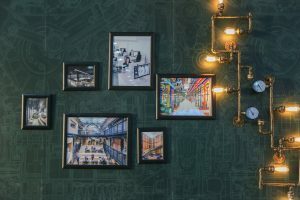 If you don’t plan to paint your walls or use wallpaper, a metal wall sculpture could be an alternative way to add some pizzazz to your home office. These tend to come in colors like copper, silver, or gold and can work on their own with white walls or as a beautiful accent against the colored paint. These are nice because they’re something out of the ordinary and have a pleasant shine to them. Most people who work at a home office spend many hours of their life in it. And while it’s not unusual for people to spend time decorating the rest of their house, this area is often neglected. Keep in mind that the way this space looks does have an impact on your productivity and happiness throughout the day and take the time to make it look great. You’ll thank yourself later!